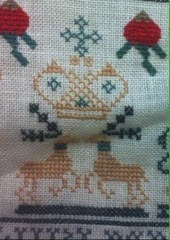 Last Sept. Kathy Lesieur came to your Sampler Guild meeting and gave a lecture on Pennsylvania Dutch Samplers. I fell in love with the clox design and the colours. The story of Sarah Boone travels and teachings intrigued me and I knew I just had to have a couple in my collection. This one I got from The Essamplaire The other I got was a Sarah Boone sampler. The reproduction designer Margriet Hogue of The Essamplaire will be coming to our guild in April and I hope I have alot of this completed by then. 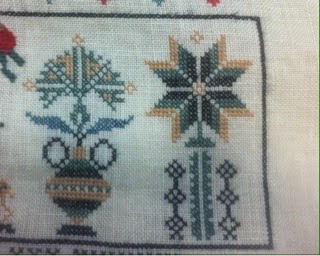 This was a sampler taught by Sarah Boone to Elizabeth.